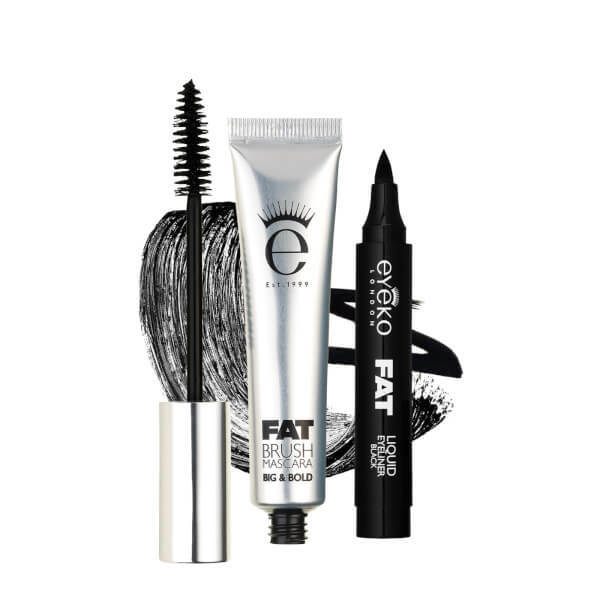 Create sultry, dramatic eye makeup looks with the Eyeko Fat Brush Mascara & Fat Liquid Eyeliner Duo. 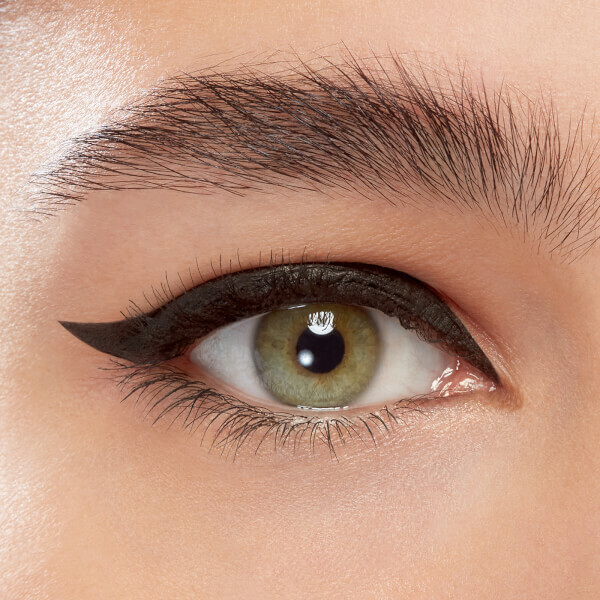 The carbon black formulas work in tandem to transform your eyes into a dramatic, showstopping feature. 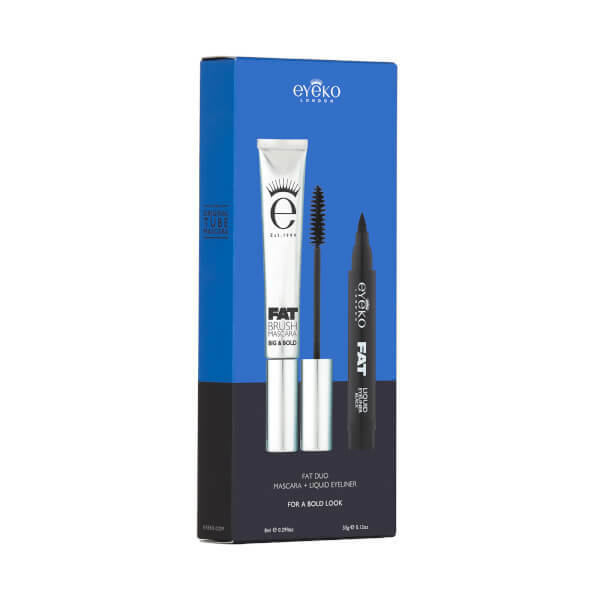 A carbon black mascara enriched with fibres and Keratin to help care for your lashes whilst intensely volumising and thickening. Housed in a squeezy tube to minimise waste, the conditioning formula works in tandem with the super-sized brush; its dense bristles capture lashes from root to tip to lengthen, volumise and intensify your eye makeup look. The mascara's fibre-enhanced formulation helps to build visibly thicker, defined-looking eyelashes. 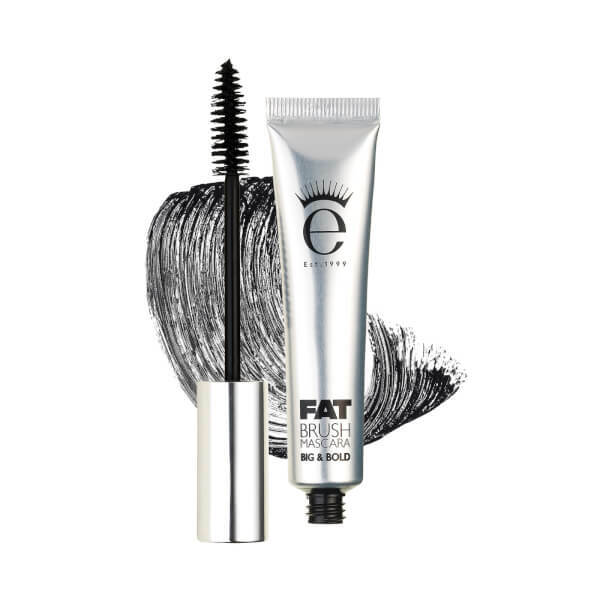 Expect voluptuous, fuller-looking lashes with no smudging, flaking or crumbling. Locks in colour for over 12 hours. Paraben free. 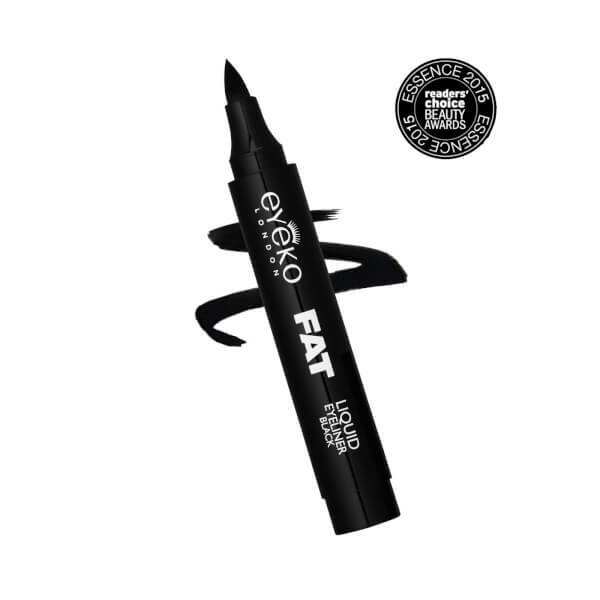 An easy-to-use liquid eyeliner pen with long-lasting, carbon black colour. The chubby pen allows you to easily control when applying, and the rich colour delivers big, bold lines, perfect for creating cat eyes or sultry makeup looks. The smudge-proof formula is infused with conditioning Algae extract so it feels comfortable on the lids. Mascara: Aqua (Water), Acrylates Copolymer, Cera Alba (Beeswax), Hydrogenated Rapeseed Oil, 1,2-Hexanediol, Cetearyl Alcohol, Copernicia Cerifera (Carnauba) Wax, Kaolin, Butylene Glycol, Isobutylene / Sodium Maleate Copolymer, Octylacrylamide / Acrylates / Butylaminoethyl Methacrylate Copolymer, PEG-40 Stearate,Trehalose, Triethanolamine, Stearic Acid, Glyceryl Stearate, PEG-100 Stearate, Phenoxyethanol, Phenyl Trimethicone, Montmorillonite, Hydroxyethylcellulose, Polysorbate 60, Chlorphenesin, Dimethicone, Nylon-6, Silica, Simethicone, Oleth-10, Polysorbate 20, Disodium EDTA, Potassium Hydroxide. MAY CONTAIN: CI 77499 (Iron Oxides), CI 77266 (Black 2). Eyeliner: Aqua (Water), Acrylates Copolymer, Propanediol, PPG-26, Sorbitol, Phenoxyethanol, PEG-40, Algae extract, Caprylyl Glycol. MAY CONTAIN: CI 77266 (Black 2), CI 77007 (Ultramarines).